Hovers about, constantly spews green liquid. Occasionally spits out a glob of green goo, leaving a small green puddle beneath it. 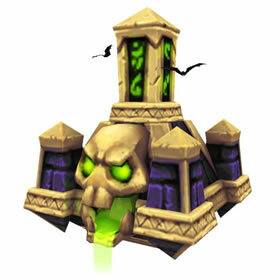 Purchasable only during the in-game holiday, Hallow's End. Tricky Treats can be obtained during the event from candy buckets inside friendly inns, defeating the Headless Horseman once per day, as well as quests and dailies. Breathes putrid smoke on to the enemy, dealing 394 Dragonkin damage. Deals 394 Elemental damage and prevents the target from fleeing for 2 rounds. While rooted the target is Chilled . I didn't really appreciate Naxxy enough until I realized Plague Breath is a dragonkin ability. This guy has such a versatile range of ability types, I feel like I can fit him into almost any team. Just got this pet today, it's absolutely awesome looking. I love the little bats flying around it lol. Only wee complaint I have.... I wish it flew when you're on flying mount. Basically this pet is a "hold-them-in-place" tank. Your back up pets can include either web based attacks that do extra damage like Spiderling Swarm or Chilled effects like Deep Freeze or Ice Lance. It is increadibly slow however so it might be best to run with a Kun-Lai Runt or it will get eaten alive from critters. With a whopping 1969 health, a choice between 3 healing abilities, and an undead passive this pet is looking to be a beast of a tank that is sure to annoy. For those who want to get it in a single day, I recommend doing the Eastern Kingdoms and Kalimdor candy buckets, with that alone you get more than enough for Naxxy. Probably one of my favorite pets in the game. It's just constantly barfing plague fluid. Where does it come from? Where does it go?